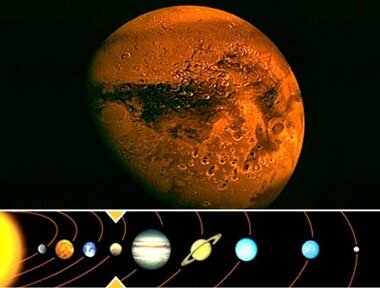 The Planet Mars exalted in Capricorn - rules over Tuesday. Since the earliest times the color of The Planet Mars, The Red Planet, has brought with it associations and feelings of conflict and aggression. These feelings are often intensified by erratic motion of The Planet Mars across the Zodiac. Indeed the Mars we know is the Roman God of War with its symbols of the spear and the shield. Mars and its deep almost blood red color is associated with confidence and self assertion, with sexuality and energy, strength, ambition and impulsiveness. The planet governs all physical activity and can help in sporting competition by increasing stamina. People born with Mars rising have a great potential for leadership and do not shy away from action and making tough decisions. On the negative side this may also lead to hot headedness and refusal to compromise or back down, which can manifest itself in many otherwise avoidable conflicts. Mars rules the first and eighth houses. Mars is the ruling planet of Aries and more modernly Scorpio. Those with Mars in Aries are very impulsive. They are passionate about life. They are spontaneous and always follow their basic instincts. They are good at making quick decisions. They detest the mundane and predictable. They are restless and are usually one step ahead of everyone else. They seldom hold a grudge and will move from disappointments quick. They thrive on a challenge and will attempt to overcome any obstacles they find in their way. Others find it hard to keep up with the fast moving Aries. They are bold and daring, They can also be emotionally demanding. They are energetic and very competitive. They can be impatient and also lack self discipline. They are not particularly affectionate and can be somewhat self centred. They are energetic, fun and playful. they can find it hard to commit themselves into long term relationships. Those with Mars in Taurus are steadfast and patient. They are persistent and show great will persevere in reaching their goal in life. They are often painstakingly slow but will also be thorough in whatever they do. They are highly disciplined and expect the others to be the same. They are prone to being stubborn and have a tendency to see things in black and white. They tend to be experts in their chosen field and strive to reach the top of the rung in the ladder to success. They tend to love the great outdoors and wildlife. They love their own luxuries. They are also highly sensual and will enjoy pleasing themselves as well as their romantic partners. Those with Mars in Gemini are passionate about life, they thrive on variety and are not scared of change. They are highly motivated and have a deep curiosity with just about everything. They tend to move from project to project sometimes juggling things at the same time. They dislike the mundane and routine daily life. They have a tendency to have more than one job at the same time in their working lives. However as they get bored very quickly they can have a short attention span and can easily become jack of all trades, master of none. They are constantly on the move, sampling new experiences and meeting new people along the way. Those with Mars in Cancer are ruled by emotions. They have a tendency for mood swings but their heart is usually in the right place. Insecurity often prevents them from moving forward and they can become stuck in a rut. They are intuitive and will watch others avidly. They pick up negative vibes from others instantly and know when to avoid these people. They despise dishonesty and will never forget an act of betrayal. They long for security and deep bonding relationships and once they find this they will seldom let go, clinging tenaciously to what they see as theirs. They are fiercely protective and loyal to their loved ones and have a strong need to nurture and care. Those with Mars in Leo are dramatic and expressive in their emotions. They often possess great confidence in themselves and in whatever they do. They like to be the very best and expect others to have the same drive and ambition. They have a tendency at times to be over bearing and demanding. They are highly motivated and passionate in their dreams and goals in life. They are very generous and warm hearted by nature. They have a knack in bringing out the best in people by encouraging them to be successful. They like to look good and take great pride in their appearance. They work hard and play hard. Those with Mars in Virgo are hard working and perfectionists. They have the ability to become successful in even the most tedious of tasks. They won't hesitate to get a job done and will do it themselves rather than wait around for others to do it. They can be demanding and are often critical towards others but are also very wise and analytical minded, therefore giving good advice when needed. They are meticulously clean and tidy. They hate disorder and tardiness and expect others to be the same. They like a predictive orderly pattern in their daily life. In relationships they seek others with the same values as their own. Those with Mars in Libra are driven towards harmony. They appear to be indecisive but this is because they like to weigh up the pros and cons before making a final decision. They are highly motivated and like to keep an even balance in their daily lives, whether in their career, family or relationships. They strive to restore balance in periods of unrest. They are creative and crave inspiration from those around them. They have a strong desire to please their nearest and dearest around them. Those with Mars in Scorpio are emotionally intense. They are passionate and highly intuitive able to see through people in any situation. They will take on any opportunity to get involved in anything new or interesting. They have the knack in making the right moves at the right time. They are competitive and will not give up very easily. They need constant stimulation to keep them moving forward with constant fresh and new ideas. They love a challenge. They are not shy in making their first move towards a new partner. They crave fresh and new experiences constantly. They can almost be possessive and have a tendency towards jealousy. Those with Mars in Sagittarius are always on the move, searching for new and wider horizons. They are physically active and love to travel. They are passionate about new experiences and will seek knowledge to develop new skills. They are seldom bored as they always find a new interest. They are free spirited and will find it hard to settle down with any one person in a relationship. They have few inhibitions. They are friendly and will welcome anyone into their lives with open arms. They often end up at the top in their career as they know what it takes to succeed and won't give up until they do. Those with Mars in Capricorn are strong willed and persistent. They are often masters in their chosen field. They can be perfectionists and expect the same from others which can ruffle a few feathers. They work hard until they achieve what they want, not resting until they do. In relationships they may not be overly emotional or affectionate but they take commitment seriously. Others are attracted to the sensual and power hungry Capricorn. They strive to be the best in everything and expect others to be the same. Those with Mars in Aquarius are impulsive by nature but have a hard fast drive to move ahead. They seldom have limitations and will do anything and everything to achieve their goal. They can be unpredictable and others may see them as somewhat unreliable. They can become quick activists in making a stand in what they strongly believe in if they feel it is of benefit to others. They will often speak their mind and are not afraid in breaking any rules by doing so. They are drawn to the different and unusual. They love new experiences and are not afraid to sample the more dangerous side that others fear to tread. They need their freedom but also love to be in company of their loved ones and friends of which they usually have many. Those with Mars in Pisces are usually unpredictable, the sign of two fishes swimming away from each other leads to two different opinions making this sign indecisive. They are however, very sensitive and will quickly come to the aid of those that need help. They can be somewhat vulnerable and easily misled but are also highly intuitive which protects them from others taking advantage of their good nature. They are empathic and are usually artists and gifted healers. They are prone to fantasy and great romantics. They want a kind a sensitive lover like themselves and will flee from those that are not alike in nature.